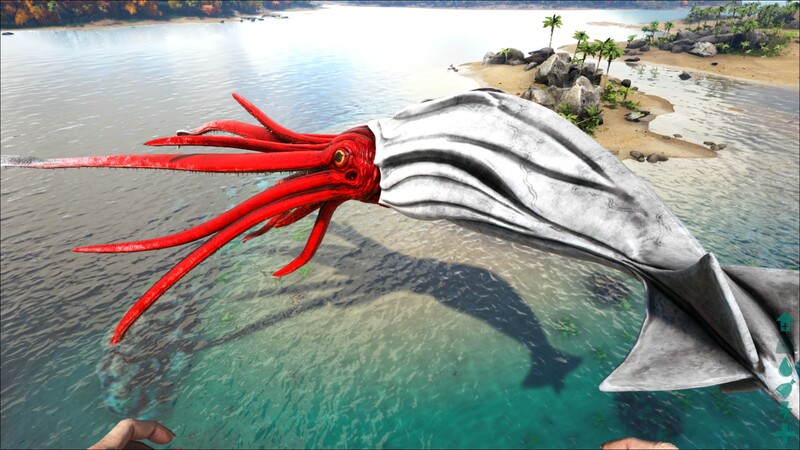 The Tusoteuthis (too-so-too thiss) is an aquatic creature in ARK: Survival Evolved. Tusoteuthis vampyrus is a very aggressive water predator. Approximately 30 feet long, Tusoteuthis is a terror of the deep. Once it grabs its prey, it slowly crushes it into submission while using the talons on its tentacles to siphon and drink the victim's blood! Tusoteuthis is a terrifying opponent for several reasons. Firstly, its grab slowly renders its victim unconscious, so death isn't the only concern. Secondly, its vampiric blood drain instantly revitalizes it, even during combat. Finally, if Tusoteuthis is losing the fight, it sprays a cloud of ink into the surrounding water, blinding its attackers to cover a sneaky escape. One of the major benefits of taming Tusoteuthis is harvesting its ink. Unlike normal ink, Tusoteuthis' ink is very oily, and can even be refined into fuels such as gasoline. Between that and Tusoteuthis' distinctive capability to grab & carry large creatures underwater, it makes for an excellent aquatic tame, despite its slower speed. Tusoteuthis is found only in very deep water, where it swims about at a slow pace. If it spots the player or a tamed creature, it will begin to move itself towards the player or said creature and attack it. Because of the unique body plan of cephalopods, a Tusoteuthis must turn itself around to strike with its tentacles. A monstrous relative of the vampire squid, Tusoteuthis bears a closer resemblance to giant squids, but is much more terrifying than its timid kin. Tusoteuthis has powerful tentacles with hooked suckers, capable of drawing blood and keeping even a Megalodon from escaping a horrible fate. A parrot-like beak hides in the center of the writhing mass, ripping flesh, shell, and bone into easy-to-swallow bits. Tusoteuthis also possesses the ability to spray an oily ink if it is in danger. Fearing only the Mosasaurus, Tusoteuthis is a true terror of the deep. This section displays the Tusoteuthis's natural colors and regions. For demonstration, the regions below are colored red over an albino Tusoteuthis. The colored squares shown underneath each region's description are the colors that the Tusoteuthis will randomly spawn with to provide an overall range of its natural color scheme. Hover your cursor over a color to display its name and ID. For example, "cheat SetTargetDinoColor 0 6" would color the Tusoteuthis's "body highlights" magenta. The Tusoteuthis - Caverns is a variant of the Tusoteuthis that can be found in the Caverns of Lost Hope. It is identical to the Tusoteuthis in all aspects. It will eat up to 50 of an individual food item in a single consumption. Taming Effectiveness is lost per consumption not per item, and is at a reduced rate compared to other tames in any case. It can eat at 90% of its maximum food, regardless of how much Food what it's being fed will restore (factoring the above). The Taming Affinity (progress) gained for food types other than Black Pearls is only 10% of the value derived by other tames (e.g. 15 from Prime Meat instead of 150), and so at least 10 should be fed at a time to have a comparable taming time to other creatures. Due to the exceptionally low Affinity from individual items, they have been omitted from the table below, which consequently omits Raw Prime Meat and Raw Prime Fish Meat entirely. Please ignore the Feeding Interval and Taming Time data (below). Due to being able to eat when at 90% of its maximum Food, the minimum Feeding Interval is 177.5 seconds plus 14 seconds per Food Level. ↑ Remember that a Passive Tame's first feeding interval is always slightly longer than this value. ↑ This cannot be known until after taming, but adding 14% of the creature's level would produce average results. Note that 50 Black Pearls will still restore up to 1500 Food regardless of the creature's current Food when fed, and so Starve Taming will actually take longer as the full 1500 food will need to deplete per required consumption (compared to allowing 10% to deplete each time). The Passive Tame hitbox is the Tusoteuthis' beak, within its tentacles. Similar to Mosasaurus, the Tusoteuthis dislikes shallow water and will de-aggro. 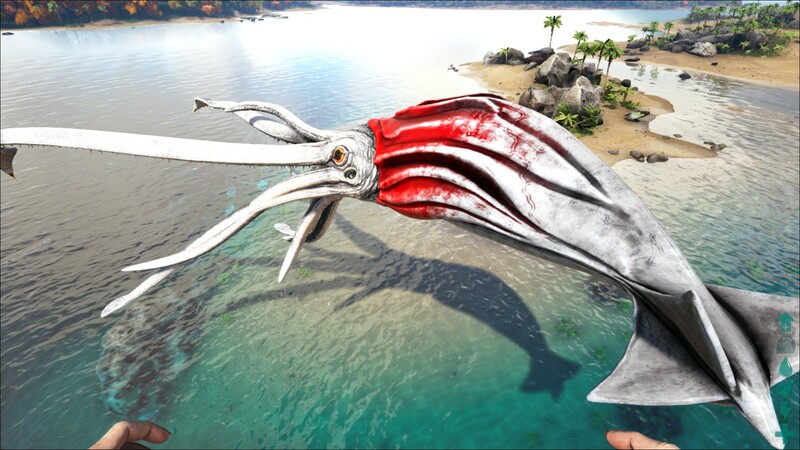 Unlike other Passive Tames, Taming Affinity is not reset when the Tusoteuthis takes damage. The Tusoteuthis "Does Not Want To Be Tamed Right Now" unless it has a creature within its clutches. 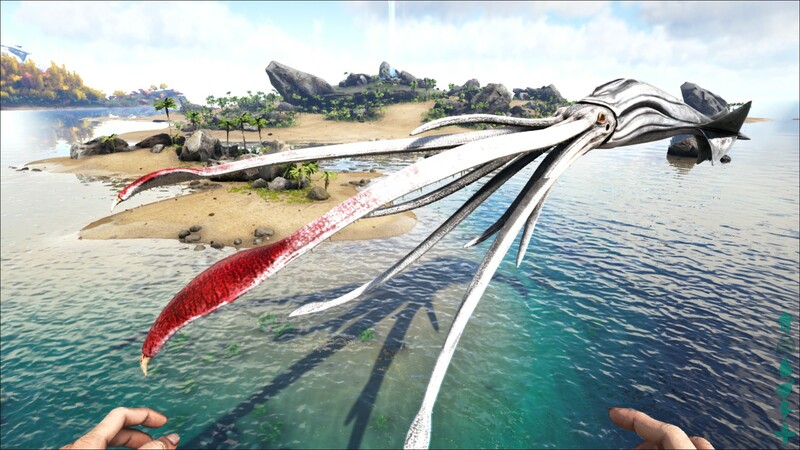 When possible, try to steer the Tusoteuthis away from terrain - it is currently possible for its grab to release creatures/players under the ground. The least-likely-to-die distraction available is a high level Carbonemys with a high armor saddle. Stimulants may also be required for taming higher level Tusoteuthis, as an unconscious Carbonemys is of no interest to the Tusoteuthis. 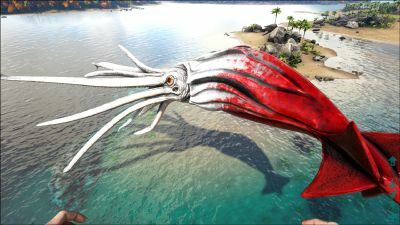 The lower the durability of the Carbonemys and the higher the dps of the Tusoteuthis: the more Carbonemys that may be required or sacrificed. Other high durability tames also work, but anything that requires oxygen is not recommended. A drowned tame is also of no interest to the Tusoteuthis. Approach the Tusoteuthis while mounted and allow it to grab your creature. Dismount then approach the creature's beak with 50 Black Pearls within your last inventory slot. Be aware of the weight of Black Pearls. Press e, , to Feed. Swim directly up and out of the deep-water zone. You are not able to re-mount while the squid has your creature held. Wait at least 3 minutes, then repeat. While riderless, the Tusoteuthis will not wait long to let go of your creature - making a team of two the safest option, as the distraction's rider can remain mounted until the creature is fed and then dismount themselves and swim up. If you do attempt to solo tame, flippers are recommended for speedy getaways. Make sure your tame is on passive and set to follow, and if it survives the feeding it will swim up to safety the moment the squid lets go. After taming, its diet remains the same (Black Pearls, Meat and Fish). However, Tusoteuthis will now eat regular meat and raw fish meat. It does not require black pearls for food when domesticated. This section describes how to fight against the Tusoteuthis. Generally the squid is a very strong enemy, a confrontation should be avoided if you're not sure you can win. A low-level Tuso is no match for a mid-to-strong tamed Plesio or Mosa. A high level one will need a very strong mount with a good saddle or a group of powerful sea dinos to be defeated. Remember that a ridden tame cannot retaliate when within Tuso's tentacles. If you're going for a pack attack, let the squid grab the dino you're riding, as you will be able to watch out for the health and the torpor of your mount and you'll have one more source of damage. When it will spray the ink and try to run away get out of the ink cloud, wait for the blinding effect to end and then easily chase your prey. You can also use another Tusoteuthis to fight it. Focus mainly on melee damage, with a little health. Swim up to the Tusoteuthis and start attacking it. It will try to grab you, but it is not able to. Keep attacking it until it tries to flee. Because the Tusoteuthis has a wide turning radius, you can keep hitting it as it tries to turn. If it is a lower level, you should be able to kill it before it gets away. If it gets away, follow it. Tamed Tusoteuthis have double the movement speed of wild ones, so you should be able to catch it. As long as the wild squid is near the ground, it will probably run into rocks, where you can kill it. Another method to kill a Tuso is luring it into underwater canyon and shoot it from above using Crossbow, it will try to attack you but his large hitbox doesn't allow it to turn effectively and it will start to turn around randomly, unable to hit you. Ranged weapons can work if used while riding a high-level dino. Due to the fast rising of Tuso's health pool, it's advised to use this tactic only on low-level ones. Its high health, good dps, life-draining attacks and grab mechanics make the Tuso a deadly enemy. Living only in the deepest seas, other animals can join the fight and turn the battle into carnage. Try to stay away from the bottom of the sea as the Tuso may drop its prey under the ground, thus killing it. The Tuso is vulnerable to packs of dinos due to its AoE that resembles a long cylinder. This means that it can't attack many enemies at once. The Tusoteuthis cannot grab creatures on PVE servers. While holding a target, the Tusoteuthis will constantly inflict Torpor, until the target is unconscious, making it the most efficient knock-out aquatic taming mount. Note that the Tusoteuthis cannot hold an unconscious target, so the mount will let go of the tame as soon as it's tranquilized. Tusoteuthis will generate Oil (Tusoteuthis) passively in its inventory over time. Tusoteuthis attack can reach far onto the shore and decimate penguin populations in seconds. Gathering large amounts of polymer. Similar to polymer farming, the Tusoteuthis' reach and AOE allows it to harvest Cnidaria with impunity, making it a good bulk harvester of Bio Toxin. Tusoteuthis was native to the Western Interior Seaway, an ocean that split North America in half during the Late Cretaceous. Despite being comparable in size to modern Giant Squid, it was still far from the top of the local food chain. On The Center, Tusoteuthis can rarely spawn in the pool at the bottom of the waterfall under the land bridge connecting Redwoods to the Snowy Grasslands. Tusoteuthis cannot sprint while holding another creature, keep this in mind when using it to transport other friendly tames. The Tusoteuthis on release was originally supposed to be much smaller, but on a last minute change was changed to be the size it is today. The Tusoteuthis is unable to grab the Basilosaurus and Liopleurodon. The Tusoteuthis can be damaged and slowed by Cnidaria but will not force player to dismount. 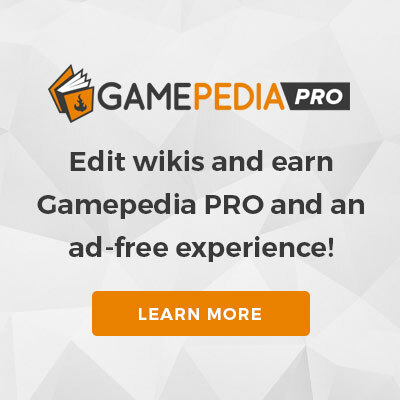 This page was last edited on 31 March 2019, at 22:37.